A quick croissant and a coffee is just about enough to keep Kevin Higgins seated long enough for what would be a really insightful account of not just teaching writing skills through the Galway based Over The Edge group but also of writing and publishing in Ireland. He dashes from one class to another with an hour to spare in between. As someone who has given just under two-hundred individual sessions to writers and students of all levels over the past year, he is in a prime place to know how emerging writing and writers are doing. 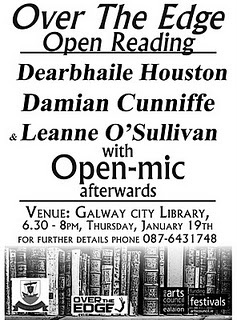 This Thursday (19th January) marks the ninth anniversary of the Over the Edge writing group based in Galway. Set up as an initial idea by his wife and fellow published author, Susan Millar DuMars, the group gave their first public reading in January 2003. It occurred as a response to the few platforms and lack of forums for emerging writers in Ireland. The idea was simple: three readers (one established and two emerging) a reading time of fifteen minutes each (no exceptions) and then an open-mic for others to throw their literary hat into the ring. “For all the kids who never got a chance to answer back” reads the dedication in The Brothers’ Lot, the debut novel from Kevin Holohan. Set in Dublin sometime during the 1950’s or 1960’s, this was a time when Ireland and its social, moral and physical attributes were not so much guided as forcefully pushed into being by the byword of the Catholic Church. Constitutionally and personally, those in charge handed the most vulnerable and needy of children into hands that were most certainly unqualified to care for them. Such was the life for the children-turned-inmates for the school for “young boys of meagre means” run by the Brothers of Godly Coercion and housed at the dead-end of Greater Little Werburgh Street, North. Holohan’s depiction of life behind the walls and fences in this school is devastating while also darkly comic. It is a world of tally sticks, novenas, Latin grammar and rote-learned lessons doled out to the children via the leather strap, a fist or a boot as much as they are through the considered teachings of the Brothers. At times it can read with shades of Mannix Flynn, Frank McCourt or Flann O’Brian. It is no direct memoir, but still a fictional account of a world all too familiar to those who were schooled in Ireland at this time. The Brothers range from those who are closet alcoholics, to those who are more blatant sadomasochistic and to others who disturbingly eat the very words of profanity they ripped from books in a sort of act of cleansing and also censorship. Always the threat of violence and also abuse hangs over the school, never more evidently than when Brother Moody arrives and takes up a post, having come from a post in DrumGloom IndustrialSchool. The imagery skilfully wrought out by Holohan echoes so much of how Church teaching – and misinterpretation of this teaching, coupled with inefficient monitoring from State bodies allowed such systems to remain in place in these schools and also residential schools. The school building itself is a crumbling wreck, symbolic for the Catholic Church as a whole, left without maintenance it has fallen to rack and ruin – physically, spiritually and morally. As was declared toSt.Peter: “Upon this rock I shall build my church” – On Greater Little Werburgh Street, North, this ‘rock’ was condemned before the school was even built. The band of workmen who came to ‘inspect’ the property were ran-off the premises in a frantic panic by the Brothers in case they prevented the school from cashing-in on ‘miraculous events’ and other interventions by the spirit of the order’s founding Brother; the Venerable Saorseach O’Rahilly. Holohan’s prose is delicately arranged and he always in control of the tone and level of anger expressed. The book is no anti-clerical rant and Holohan never allows to be a personal crusade but rather an expression of the mood of the nation in trying to grasp an understanding of what happened to so many of the country’s youngest citizens. Saying all this, the Brothers’ Lot is also genuinely hilarious in parts. Holohan’s characters, from the children to the exasperated janitor do highlight that humour and wittiness of the soul is not so easily extinguished. Finbarr, the Cork boy who moves to Dublin to this alien world with his family is, often like the reader, looking at life inside such schools for the first time. Holohan also highlights a touching reference to those girls who also suffered in residential laundries and I believe readers of all ages will take much away from reading this story. The Brothers’ Lot is a delightful book that will raise laughs, tears and grimaces from readers, and all in quick succession. It was submitted for the Guardian First Fiction Award and is published in paperback by No Exit Press. 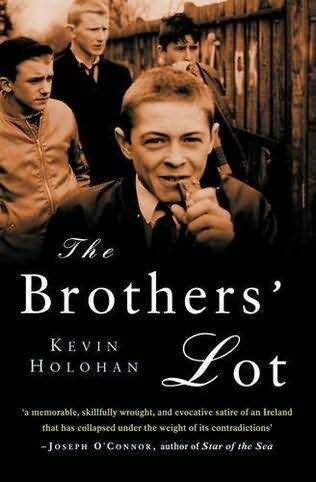 There is an interview with Kevin Holohan on Writing.ie here and there also copies of The Brothers’ Lot up for grabs. It is a completely new departure. You have spent the previous six years working towards getting here and most definitely a hellish last few months; but you made it. You are now in college! As an overload of information, of new faces, new places and new responsibilities come pouring at you, it really is a time to savour – your reward for enduring and beating the points system and earning your place in your chosen course. Coming into a third-level university library can be at first a daunting experience. Where exactly do you begin? University libraries have never before been packed with so much information and with online access to near endless databases and resources; your worry may at first seem justified. However, once you get to grips with what your library has to offer you, you will soon realise that it will make your college experience so much easier. For the rest of this article, its advice, Do’s and Don’ts on using research Libraries at University, click here: http://tiny.cc/chame and follow www.writing.ie for more. 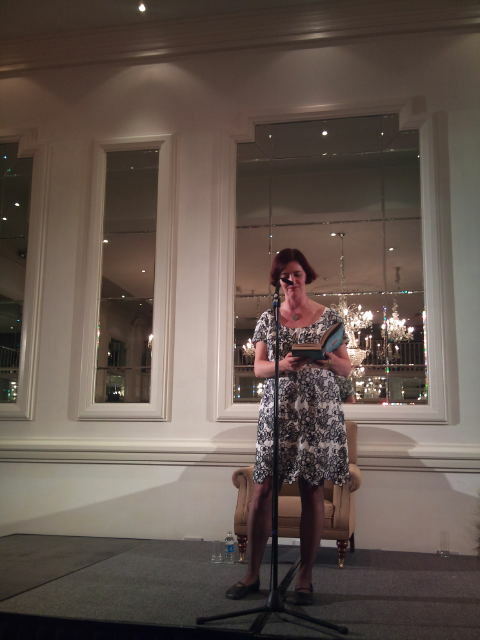 The final literary event as part of the 2011 Galway Arts Festival was certainly a resounding way in which to draw a truly amazing Festival to a close. 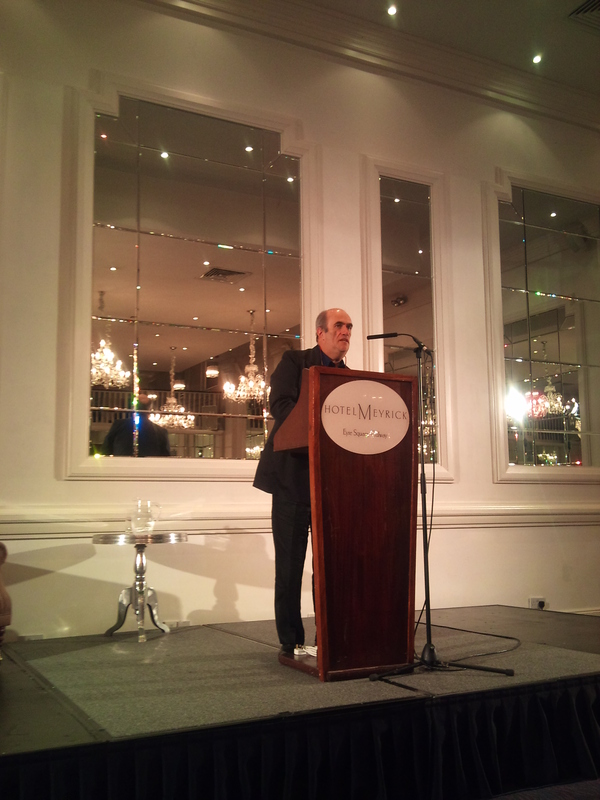 The IMPAC award winner and Booker prize nominee Colm Toibin did not disappoint the sell-out crowd that filled the Meyrick Hotel on a sun-filled Saturday on the final weekend of the Galway Arts Festival. While the thousands were enjoying the festivities on the thronged Galway streets, those with a ticket for Toibin certainly would not swap for any prize. Toibin was in warm and open form as he took to the lectern on stage in the Connemara Suite of the Meyrick. He started into a story recounting his experiences of regional arts festivals in Ireland. Toibin outlined how the Gorey Arts Festival , founded by his late friend Paul Funge, opened up such opportunities throughout the early 1970’s and onwards as it afforded the locals to see amazing works of theatre, hear great writers read their works and to see the works of great artists. He talked in particular about visit to the Gorey Arts Festival by Patrick MaGee and Jack McGowran, both renowned acquaintances of Samuel Beckett and also famous actors of his work, so much so that Krapp’s Last Tape actually had a working title of ‘Monologue for Magee’. Toibin spoke of these characters, Beckett, Magee and McGowran as if he was with old friends sharing a drink and a story. 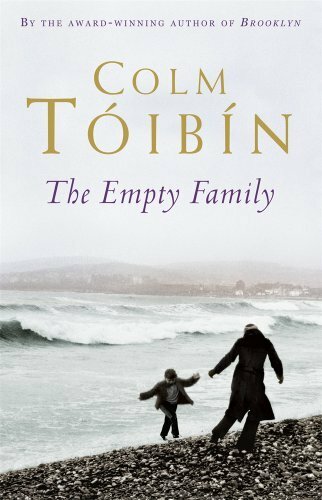 This affability, genuine warmth and connection with his readers as well as with the people he is writing on paper about makes Toibin one of Ireland’s most loved and successful of contemporary writers. Toibin read from his latest work, his collection of short stories the Empty Family (Read my review of this here ) Reading the story Two Women, Toibin presented one of the most memorable stories from the collection. Set in present-day Ireland, a divorced and middle-aged TV producer who has put all of her strength and passion into her career is brought to relive her past lost love when she encounters a woman from the past: a woman she has never met but with him she shares so much experience and people. Following this the floor was opened up for questions for Toibin. No shortage of willing volunteers as question after question were ably taken by the guest of honour. When asked about his setting out to write his IMPAC-winning work, The Master, Toibin answered he wanted to really get to know the man, Henry James, and not the outward character which people may have known. To Toibin, James was a mysterious character, often proving to be the opposite of what you thought. James was gay but loved the company of women as well as men, he was often reclusive but ate out every evening in large company. James’ writing, Toibin, described, is full of winding and snaking sentences, full of sub-clauses. You don’t get to know the Henry James, the man, from his writing, as you would be able to know James Joyce from reading his Portrait of the Artist as a Young Man. Toibin was also asked about his inspiration about his Costa Prize-winning novel, Brooklyn. Again delving into his rich personal memory, he talks of the scene at his father’s wake. Colm Tobin is a twelve-year-old and bewildered by the streams of people calling to the house, stayed so long and talked and talked with his family. One woman in particular stood out, even after all these years. She had a pile of letters in her hand, all from Brooklyn: not from U.S.A., not from New York, but from Brooklyn. “That’s the woman whose daughter went to America but came home”, Colm heard people whisper. He never forgot this woman, even over the following forty years or so, and so Brooklyn came to be. Speaking about the books ending (no spoilers will be given!) Toibin simply outlined how he ended the book the way he wanted to end it but crucially, he got their convincingly. He had conceived other endings but would do a disservice by inserting radical changes that would arrive at a contrived ending. Finally, Toibin was asked about what contemporary writers he is currently reading. His first response was an American writer who actually also read at this year’s Galway Arts Festival – Willy Vlautin. Vlautin (nearly if not fully) stole the show when he shared the bill with Roddy Doyle. (read review here ) Upstaging Doyle is no easy feat but Vlautin made a new home from home for himself in Galway with his fantastic writing and engaging and humorous personality. Toibin hailed Vlautin as “a real discovery. He writes in beautiful American tones and with an absolute knowledge of rhythm, coming as no surprise that he (Vlautin) is an accomplished musician. Also singled out by Toibin were the Austrian short-story writer, Tim Wenton, Welsh writer Tessa Hadley and of course Canadian Alice Munroe. It was a fascinating evening and a great if also rare opportunity for an intimate evening with the one and only Toibin. Evening like these are exactly what Arts Festivals are made for –probably along the lines of what Toibin felt like attending the Gorey Arts Festival all those years ago. 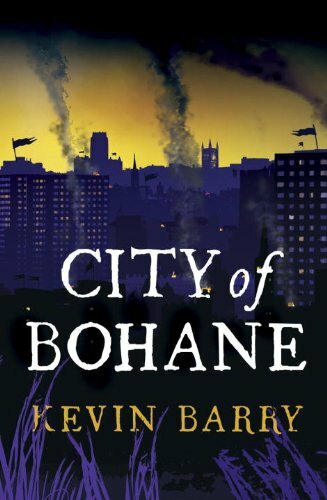 Review: Kevin Barry’s Debut Novel, ‘City of Bohane’. For those of you read “There Are Little Kingdoms”, the wonderful and Rooney Prize winning collection of short stories by Kevin Barry, his debut novel was perhaps the most eagerly awaited publication by any Irish writer for quite some time. Published in March of this year, the novel was launched to a sell out crowd at the Druid Theatre, Galway as part of the city’s renowned Cùirt International Festival of Literature. On that occasion, Barry himself was on hand to give a resounding reading of his latest creation, the City of Bohane and its many inhabitants. Bohane is the throbbing epicentre of Big Nothin’. Its inhabitants are tribal, vicious, and territorial with a feral and possessive quality. The map accompanying the book to this area could be a province of Tolkien’s Middle Earth as much as this alternate western Irish seaboard of 2054. The river flows into the heart of Bohane and brings with it the smell and air the city folk breath as they go about their daily business of drinking, whoring, smoking, fighting and gambling. “Whatever is wrong with us is coming in off that river. No argument: the taint of badness on the city’s air is a taint off that river.” The city is kept in line, just back from the edge of total deprivation by Logan Hartnett and his gang The Fancy. With his heavy muscle, the exquisitely named Fucker Burke and Wolfie Stanners, things tick along as only they can in Bohane. To read the rest of my review, which is published on Writing.ie, please click here and go to www.writiting.ie for more.